On December 12-13, 2018, CAIDA and the Massachusetts Institute of Technology (MIT) hosted the (invitation-only) 9th interdisciplinary Workshop on Internet Economics (WIE) at the University of California San Diego in La Jolla, CA. The goal of this workshop series is to provide a forum for researchers, commercial Internet facilities and service providers, technologists, economists, theorists, policy makers, and other stakeholders to empirically inform emerging Internet regulatory and policy debates. This year's focus is the measurement and analysis of progress toward a given Internet policy goal. should that data be provisioned (shared) by public sector, or be encouraged(?) and provisioned (shared) by private sector, either commercially or academic/non profit? As in previous years, the format of this meeting is a series of focused sessions around specific, pre-selected topics. Presenters will prepare short talks (10 minutes) on issues related to the topics. Not everyone will give a prepared talk, but we expect everyone to participate in the discussions, as well as provide input, writing, and/or feedback on the report we'll publish within shortly after the workshop. Our goal is to produce a public workshop report, but the discussions themselves (and the identity of specific speakers) will be specifically off the record. The WIE workshop is a closed workshop, by invitation only. Harold Feld (Public Knowledge), The Primary Question of Policy and Research: Why Do We care? Geoff Huston (APNIC), Why don't we have a Secure and Trusted Inter-Domain Routing System? What topics do people want to see next year? Car: Rental available at the airport near the baggage claim areas of Terminals 1 and 2. Taxis and drop-off: San Diego Taxi Information maintains a list of taxis with rates and additional information. Uber and Lyft are also well established in San Diego and now have access to service San Diego's airport. GPSes will need to go to the intersection of Hopkins Drive and Voigt Lane. 10100 Hopkins Drive, La Jolla, CA 92093 is the nearest street address most GPSes/maps recognize. This should take you to a small turn-in in front of the SDSC East Entrance / Auditorium, with a building sign visible that reads "Halicioğlu Data Science Center". 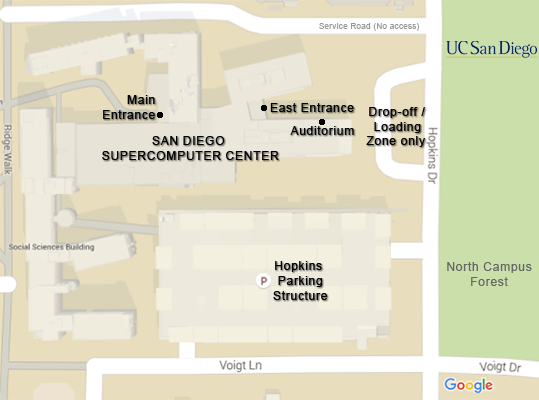 Parking Permits: Parking permits are required to park on UC San Diego Campus. Parking legally is the attendee's responsibility. It is recommended you find parking at the Hopkins Parking Structure. Near the elevators will be a parking permit machine that sell passes for $30/day. Alternatively, use the ParkMobile app to buy a permit for Zone 4736 (if parking at Hopkins). With a permit purchased, you can park in any White " V ", Yellow " S " spaces unless otherwise indicated. (New for 2018: purchased permits are no longer valid in green "B" spaces) Please be sure to read the directions on the parking permit. Parking is limited. The penalty for an improperly parked car is at least $65 per day. We cannot be held responsible for citations issued for parking in an incorrect space or improperly displaying your permit. From the Hopkins Structure, after setting your permit, take the elevators to the 2nd floor and walk safely out to the street Hopkins Dr. to the Supercomputer Center. The auditorium is on the left just before the stairs, labeled Auditorium or B210E/B211E Meeting Room. For transportation concerns, general questions and help before the workshop, contact CAIDA at <admin-staff at caida.org> or (858) 534-5109.